Dropping water levels in Umiam (Barapani) Lake in the state of Meghalaya in northeast India are causing tension among competing water users. This lake was constructed as a reservoir for a hydroelectric project in the 1960s. It (and associated tributaries) provides water for power generation, agriculture, drinking water, and recreation. Not only does this lake face dropping water levels – 39 feet over the last three years, to be exact – water pollution is also becoming a serious problem. Untreated sewage flows into the lake from streams and rivers that pass through the capital city of Shillong. Increased sediment enters the lake resulting from urban sprawl in Shillong. Construction of roads and buildings in the city cause soil erosion. And, because of the urban sprawl, poor farmers must change cultivation patterns which is also leading to rapid soil erosion. Lake problems are compounded by the fact that numerous stakeholders are responsible for different areas of management. One organization called People’s Learning Centre believes that bringing stakeholders together to plan integrated approaches for lake-water management might be the answer. On March 9 and 10, 2009, they hosted a conference (with the support of Arghyam) in Shillong to allow various stakeholders to discuss conservation strategies. Videos and presentations are now available on the India Water Portal. To celebrate today – World Water Day – UNICEF has released Tap Project Radio. I was going to wait to tell you this in my formal post regarding World Water Day, but it’s too terrific to wait. Tune your computer dial to Tap Project Radio to listen to chill music and make a donation that will help the one billion people in the world without access to clean drinking water. This internet radio station will be broadcasting today through World Water Week from March 22-28, 2009. The Tap Project is a movement sponsored by UNICEF to gather donations and teach others about water and sanitation problems worldwide. The Tap Project raises money during World Water Week by encouraging restaurants to sell tap water for one dollar instead of bottled water and engaging in print and media campaigns. Each dollar raised will provide a child with drinking water for 40 days. Tap Project Radio will be broadcasting 24-hours a day featuring celebrity DJ’s and interviews. Check out the schedule for more information. So far, I’ve listened to Sublime, The Clash, Dylan, and Death Cab for Cutie. Now, I’m totally in the mood to write a post for World Water Day. Hello, friends. This post has been on my to-do list for about five days now. My apologies in the delay providing this information to you. Opponents of the WWF state that many members of the World Water Council are from multinational companies and, likewise, inclined to support unsustainable water management in the form of water privatization. As I posted previously on my blog, the global water justice movement has organized numerous events this week. And, this weekend, another event called the Alternative Water Forum will be held. This conference looks especially interesting to me because of the workshops and speakers offered each day. Some of the workshops include Ecologic Water Management, Hegemony, War and Water Politics, Global Climate Change and Water Politics, and Water as a Common Good and Water Management. For more information, they have a very good brochure detailing the entire weekend of events. For a different perspective from inside the 5th World Water Forum, you might also like to check out Dr. Michael Campana’s Water Wired blog. Folks, it’s that time again. Time for another Public Service Announcement for the PSA-a-thon Series. Our fourth PSA in the series couldn’t be more timely. This PSA recognizes the upcoming TAP Project by UNICEF during World Water Week from March 22 to March 29, 2009. This project aims to raise money during the week in a simple way – ask restaurants to sell tap water for 1$ instead of bottled water. All proceeds raised will help UNICEF provide clean drinking water to children throughout the world. Did you know that 1$ can supply one child with safe drinking water for 40 days? So, check out the PSA. If you like it, get involved. Be a volunteer in your city and ask restaurants to participate, coordinate a walk for water, or raise money at your workplace. Be sure and check out the first three PSAs featured in the series on rainwater harvesting in India, the LA Tap Project, and a water-conservation campaign in Denver. Lately, I’ve been so busy with grad school that I’ve neglected my blog. Luckily, there are people like those over at the Youth Noise Drop Campaign still working tirelessly to improve global water and sanitation conditions. Previously, I let you know that they were hosting a summit in NYC for young activists to learn more about global water issues. Well, they hosted the summit and have posted the video on their website. Plus, the Drop Campaign website is super cool. They offer monthly tips on water conservation and water actions, have links to a whole community of other individuals interested in global water, and encourage people to be more aware of global water issues. Can you imagine if rainwater harvesting was as prevalent in the United States as in India? Bus stations and rail stations would be equipped with rainwater harvesting systems for sanitation and drinking water purposes. Commercials on televisions would promote rainwater harvesting. Cities would emphasize rainwater catchment as a part of development and growth. Government officials would recognize the importance of rainwater harvesting systems, and provide funding and technical knowledge for such measures. Municipal water purveyors would convert civic buildings and gardens into storage tanks to collect rain water, especially in high water use locations like gardens and laundries. It would be, and very well could be, an entirely different place if we started to promote and construct widespread rainwater catchment systems across the country. Prolonged drought occurring in the southeast and southwest of the United States has reminded us that we are not as water-secure as previously thought. And, maybe, we will have to start to think “inside-the-water-catchment-box” to ensure potable water supplies into the future. Most likely, we could probably take a cue from countries, such as India, that are already implementing such progressive systems. The United Nations General Assembly declares 2008 the International Year of Sanitation. This declaration will assist progress on one of the eight Millennium Development Goals that aims to provide sanitation infrastructure to half of all people in the world without such by 2015. Several UN partners are supporting this measure including UNICEF, UNEP, UNDESA, UNDP, UN-Habitat, UN-Water, to name a few. Over 40% of people (2.6 billion and almost one million children) throughout the world do not have adequate sanitation facilities, such as bathrooms or ample water supplies. Frequently, deaths occur because deficient sanitation often encourages the spreading of illnesses such as diarrhea, cholera, worms, pneumonia, and malnutrition. Check the UN web-site for more information on International Year of Sanitation projects. India, out of necessity, has encouraged the construction of rainwater catchment systems throughout the country. This short public service announcement, produced by the Centre for Science and Environment (CSE) in India, highlights the importance of rainwater harvesting in the region. With rise of global population, changing seasonal weather patterns, and fluctuating economic conditions, rainwater catchment could prove to be one cutting-edge option to ensure adequate water supplies throughout the world. People in India have been harvesting rainwater for thousands of years. Presently, many organizations in India are continuing to promote rainwater as a sustainable water supply. Previously on this web-log, I briefly introduced an organization, Sustainable Innovations, that is developing rainwater harvesting systems for many in need in rural and arid Rajasthan, India. Another organization spearheading several campaigns relating to rainwater harvesting is the Centre for Science and Environment in India. They host the web-site rainwaterharvesting.org and publish the magazine, Down to Earth. The director of the institute, Sunita Narain, won the 2005 Stockholm Water Prize for her work with rainwater harvesting in rural areas. Community-born environmental movements often bring about most significant change, particularly in countries with a lack of stringent environmental regulations. 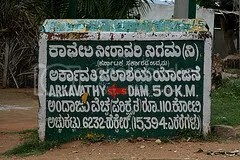 As in the Times of India, one of many examples is a grassroots driven river restoration project occurring in Bangalore, capitol of the state of Karnataka in India. Environmentalists in the region are staging a campaign to bring attention to conservation and preservation of the Arkavathy River, tributary of the Cauvery River. Water levels in the Arkavathy River have been dropping over the past several years, as well as nearby groundwater aquifers. This campaign is part of a larger event planned for India in 2008, by leading India water scholar Rajendra Singh, called Lokadesh. Rajendra Singh said under Lokadesh 2008, experts will take up one dead, dying or polluted river in every state for rejuvenation by adopting a decentralised, community-driven approach. Singh called for the declaration of Year 2008 as Year of River Rejuvenation. 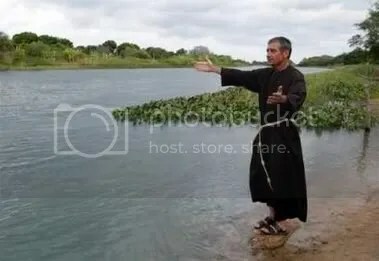 Bishop Cappio’s health is beginning to deteriorate, as he continues a 23-day hunger strike in a non-violent action against artificial diversion of the Sao Francisco River, fourth largest river in Brazil. The irrigation project aims to pump water from the Sao Francisco River through 435 miles (700 km) of canals to people and farms in the arid and poor northeast, where President Luiz Inacio Lula da Silva was born. This is the second hunger-strike employed by the Bishop against artificial diversion of the Sao Francisco River (the first was in 2005). He is very worried about the negative effects this irrigation project will have: greatly minimizing flows of the river limiting irrigation water available for local, less affluent individuals, and a dire ecological outcome to an already unhealthy ecosystem. While Vatican and Brazilian officials plead with the Bishop to conclude the fast, he had indicated he has no intentions to take nourishment until the project is denied, once and for all. An industrious friend of mine is planning life off of the grid. She will grow her own food, utilize alternative forms of energy, and supply her own water (without having to dig a well). Recently she questioned, is it possible to provide water for a home using only rainwater? In my neighborhood in Washington, many people use barrels under gutters to collect rain for simple gardening needs, but homes in this area that harvest rainwater for all household needs are few and far between. This guide published by the Texas Commission on Environmental Quality provides a wonderful overview of “Harvesting, Storing, and Treating Rainwater for Indoor Domestic Use”. While homes in the US relying on rainwater for all needs are not very common, there are people using such systems with great success. Understanding and installing rainwater catchment systems now could greatly reduce risks associated with decreased water availability in the future. The small island of Cyprus is facing a fourth year of drought, with water reservoirs dwindling dry at less than 9% of original capacity. As a recent article on Reuters indicates, climate change is thought to be linked to the continued parched conditions. Statistical analysis of rainfall in Cyprus reveals a decreasing trend of rainfall amounts in the last 30 year…The rate of decrease of the average precipitation in Cyprus during the 20th century was one millimeter per year. Desalination of seawater is not an ideal choice for the authorities, but it has saved Cyprus before. “We don’t desalinate lightly, without being aware of the consequences,” said Partassiades. “It is energy-consuming … and this causes (greenhouse gas) emissions Cyprus has to pay fines for. Water restrictions have been put into effect on the island, until the situation improves, with a hope of rainfall to occur this winter. 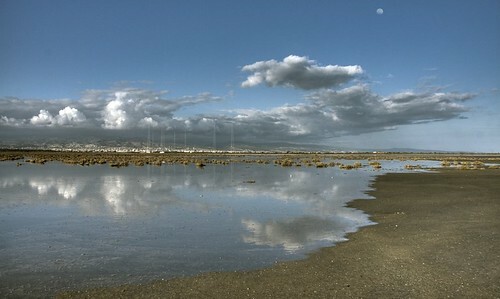 Cyprus, with Limassol city in the background, photo courtesy, LaRezistance on flickr. With the recent advent of climate change into mainstream media, most individuals are aware of a concept called a Carbon Footprint. If not, I will let you know briefly, a Carbon Footprint is a measure of how much C02 a person produces by lifestyle choices. However, less popular, but no less important, is the concept of a Water Footprint. This concept calculates a measure of how much H20 a person utilizes by lifestyle choices, or average annual water consumption. UNESCO-IHE and University of Twente in the Netherlands have been actively researching the concept of a water footprint, as well as the concept of virtual water trade. On their website, they have developed a tool that will calculate individual and country specific water consumption. Calculate your total water consumption here. Photo courtesy, eisenrah on flickr. Given my interest in water conservation, I decided to calculate my annual water-usage. Using the water footprint calculator, it was difficult to know if my entries of weekly foods in Kilograms were exact. However, after a little thought, I was able to accurately gage my edibles by the pound for conversion into Kg. My entries concerning home usage were much easier including showers, dishes, and yard-watering.